During their work on the project (workshops, study tours, conferences etc. ), but also during their day-to-day work and in regional meetings, partners will come across parks, gardens, initiatives, policies etc. – within and outside the partner regions – that they consider as good practice examples. Two of those good practice example are published here and others will be added frequently. In addition to these shorter presentations, the partnership is working on a total of seven Best Practice Case Studies as longer reports presenting policies, activities etc. implemented in and/or by the partners identified as best practice during the preparation of the project Hybrid Parks. Malmö Slottsträdgården (Castle Garden) is a fully organic garden in the centre of Malmö, Sweden. Work on the garden was begun in 1997 and the garden was run by a non-profit organisation in cooperation with the city council. The gardens are now run by the council and the popular café is run by the friends association, the “Vänförening”. The garden aims to be a meeting place and a source of inspiration for local people and tourists alike. The garden is a host to a large number of cultural happenings over the year, music concerts, theatre, horticultural workshops, plant days and of course all those spontaneous events that occur in green open spaces. The garden consists of a large vegetable/cut-flower garden and eight themed gardens: the rose garden, insect garden, hanging garden, schools garden, Heidi’s garden, climbing garden and the Japanese garden. Some of the gardens are new, some old and some are being phased out and replaced. A nursery is maintained with over 200 kinds of perennial plants for sale. The gardeners are accessible during the day and always willing to answer any questions. One of the main features and success stories of the garden is the fact that people (irrespective of their skills, biography, ethnic backgrounds) are welcome to give a helping hand any time and hopefully pick up some gardening skills on the way. Many co-workers and volunteers successfully continue with some form of horticultural education at local colleges. This successful mix of social, environmental and even economic (café) profits, adding an open, high quality environment to the city centre has been valued by the partners of the project as a best practice example on the way to a hybrid park. In the tradition of the IBA Emscher Park, the state of North Rhine-Westphalia has been involved since the 1980s in the so-called “Regionale” master plans. The term is composed of the two words “region” and “bienniale”. It describes a development program or a kind of a structural fund which – every two years – gives a selected region in North Rhine-Westphalia the opportunity to present itself by carrying out ground-breaking regional development measures. Thereby the qualities and characteristics of each region will be acknowledged and their future development will be stimulated. Under the term “Regionale 2010” the Cologne / Bonn region has agreed on a “Regionale” master plan up to 2010, involving the cities of Cologne, Bonn and Leverkusen and the several counties (Rheinisch-Bergischer Kreis, Oberbergischer Kreis, Rhein-Erft-Kreis and Rhein-Sieg-Kreis). Based on the common theme “Building Bridges”, about 40 projects have been developed – most of them related to education, mobility and nature. One of the initiatives of a higher spatial relevance within this “Regionale” master plan is the “RegioGrün” design concept (http://www.regio-gruen.de). The objective of this concept is the sustainable protection of open spaces and the setting up of a coherent network of cultural landscapes. Here, unique landscape features shall be highlighted and a strong focus been given to important characteristics of landscapes, nature, cultural and industrial heritage. Based on the history of the inner and outer green belt of Cologne, the “RegioGrün” design concept develops five open space corridors which as “radials” will extend into the natural areas situated on a longer distance from Cologne city centre. These more distant landscapes will be upgraded by the radials to form a third greenbelt. In addition, the corridors will help to structure the suburban regions and to adjust the urban development. While the IBA Emscher Park has resulted in new perspectives and opportunities for abandoned industrial landscapes along the Emscher River, the Regionale 2010 master plan together with the “RegioGrün” design concept has focused on the landscape affected by agricultural use in the outer metropolitan areas surrounding Cologne. One element within these green belts is the “Northern Corridor”, which is primarily located on the left lower Rhine terrace. This corridor shows some very characteristic fragments of the cultural landscape and is accessible for the public by a cycle route, which connects the Media Park in Cologne’s city centre with the still lively Monastery Knechtsteden about 20 kilometres to the North. Within this northern corridor the North Park of Pulheim was developed as a new project, which is referred to as a “Hybrid Park” below (PDF link, report in English (en) or German (de)). 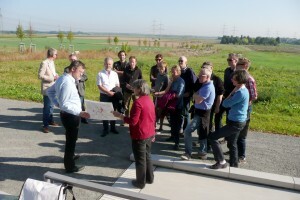 On 6 and 7 September 2012, planning professionals of the regional planning authorities in North Rhine-Westphalia who are responsible for open space development had a joint meeting in Cologne to discuss central ideas and objectives of hybrid parks. In addition, they visited the North Park, guided by the local planner of the city of Pulheim, Ms. Cassen-Sasse, and Professor Boehm, member of bbzl – böhm benfer zahiri landscape architecture, who designed the park. The group agreed that the only way to secure appealing, interesting spaces for recreational uses around the residential areas for a longer term is defining a clear purpose and creating a specific upgrading of the usability and attractivity of these spaces. Especially in the suburban areas, the preservation of open spaces has to be secured in rivalry to many competing interests, in particular requests for housing developments. Moreover, recreation spaces in the rapidly growing suburban areas close to large cities could not be developed to catch up with the expansion of settlements in the past. Here the concept of the hybrid parks can be used to balance deficits and to fulfil these requirements in the future. Regional planning in North Rhine Westphalia has established the planning instrument of regional green corridors for a provident or proactive protection of relevant open spaces against conflicting uses and for the creation of a supra-local network of open spaces.